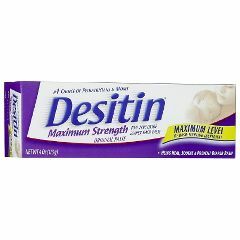 Desitin Diaper Rash Ointment helps protect chafed, chapped, and cracked skin due to diaper rash. Rich, thick zinc oxide formula helps heal, soothe, treat and prevent diaper rash. Hypoallergenic and pediatrician tested, so it's gentle on tender skin. Soothing. Safe. Easy To Use. Promotes Healing. No Side Effects. We use this on my son who is bed ridden and has no voluntary movement. For over 20 years it has prevented rashes and skin break down. We also use it on ourselves for small bites and minor skin irritations. Soothing. Safe. Easy To Use. Promotes Healing. Promotes Healing. 4 oz vs 3 oz and cheeper. No Side Effects. Reduces Pain. I use this on my dad to help reduce pressure sore and it helps soothe his bottom since he is wheelchair bound. WOW! Your company has given me such tremendous service, I wish I could tell everyone that needs medical supplies to order through you! Thank you! My husband was released from the hospital on Friday after two surgeries and although we were given a couple days of supplies for his dressing changes, we were told any pharmacy would carry the products we needed to purchase. Well, we live in Green Bay WI (which is not a small city) and local pharmacies did not carry these products. I didn't need the additional stress of not having dressing supplies while I had a husband who was weak and needing additional attention. The Google search I did was simply that, a search. I am not sure what drew me to your site or in fact to order, but what a blessing my decision was! I was hoping as I ordered that the supplies would arrive before Thanksgiving, and we already had them on Tuesday - just two days after I ordered!! And, the products are exactly like the hospital was using! Thank you so very much! Happy Thanksgiving and Happy Holidays! You must be very proud to head such a reliable business. Congratulations!